The Aztecs spoke the classical Nahuatl language at their great city of Tenochtitlan, which is now the heart of central Mexico. The Nahuatl language really only lasted about a century starting in the mid 1300’s until a little over the 1500’s. To this day the Aztec ancestors still speak Nahuatl with some variation compared to the classical language and it is considered as a dialect in Mexico. Many Spanish words originated or were borrowed from Nahuatl and English words include chilli, chocolate, avocado, and coyote all originated from the Nahuatl language of the Aztec people. During the Aztec empire, the city of Tenochtitlan grew to become the largest city in central America, and with it grew the number of speakers of Nahuatl from various areas which resulted to the transition of the language into many dialects. The Nahuatl language continued to spread throughout Mesoamerica especially after the Spanish conquered new territories, with the Spanish having to learn Nahuatl to establish their colonies. King Philip II of Spain actually decreed it as an official language in 1570, and besides, the friars found it impossible to learn all indigenous languages so they concentrated on just the one, Nahuatl. The Spanish missionaries introduced the Latin alphabet then taught the language as far as the Honduras and El Salvador. 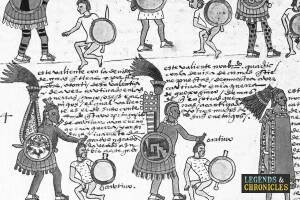 Classical Nahuatl was used as a literary language with works such as poetry, history, and administrative documents written around the 16th and 17th centuries. Literary samples included a compilation of Aztec Culture by Franciscan Bernardino de Sahagun called the Florentine Codex, song collections like Cantares exicanos, Fernando Alvarado Tezozomoc’s list of royal lineage of Tenochtitlan and even a Spanish and Nahuatl dictionary written by Alonso de Molina. By 1969, King Charles II decreed that only the Spanish language could be used, which essentially causing the extinction of the indigenous languages including Nahuatl. Literary works were preserved mainly by written record, through existing books or passed orally through the Aztecs direct descendants. Aztec language was very complex and was designed to really be spoken and not read, causing issues with translating the language to written form. The system the Aztecs used was through the use of pictures and symbols for their alphabet and vocabulary. Whole sentences can be expressed with one word, for example, they drew a cat to symbolize a cat, a fish for fish, in essence they basically formed pictures to remind speakers of what they learned verbally. Stories and records that used these pictographs were called codices. This system had various ways to display the language, logo grams were used for words, pictures used as mnemonics and logo grams were used for sound. The writing was done by the Aztec who knew how to read them, which would be the Aztec priests and the scribes. These Aztecs were the ones who wrote about their history, the Aztec world and their religious ceremonies. Typically the priests and scribes wrote with charcoal and used minerals, vegetables, shells and insects for colour, and they often etched in stone too. It was later during the Spanish conquest when the Spaniards introduced the Latin Alphabet that most of the literary works of and about the Aztec society were written. The Aztec Codices were essentially long books written on strips of paper, the Aztecs took great pride in them and carefully folded each Codice into a tube with wood covering each end. The 20 centimetre by 50 meter tree bark or deerskin paper sheets were written on both sides and can be read from top to bottom or from left to right. These codices serve as a basis for most of the study about the Ancient Aztec Empire, and feature a mix of images and Aztec writing. The Codices hold all kinds of information about the Aztec’s history, from religion and rituals to their daily routines and way of living. The ancient Aztec language of Nahuatl still exists in some form in the modern world. However at the height of the Aztec empire, Nahuatl was the primary language in Mesoamerica and was the language that the Spanish were most keen to learn.